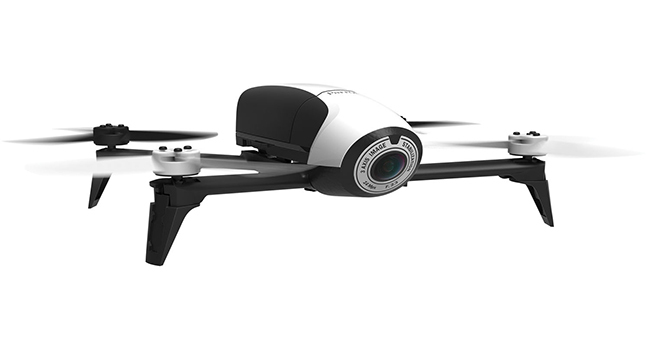 The Parrot Bebop 2 is a moderately priced drone with promising features, a sleek design, and a very moderate price tag. Its lightweight, compact frame handles well and will be both easy to transport and to navigate with. The system lends itself well to taking high-quality photographs and videos, and also to simply having fun. And, the drone’s smartphone compatibility ensures that you will enjoy a unique experience that will give you a majestic look at the world down below from up above. Parrot Bebop was clearly trying to keep things sleek with this drone. To that end, they were very successful. It weighs only about one pound with dimensions of 15 x 3.5 x 12.9 in. With that size, you aren’t going to have any trouble transporting it with you wherever you go. The display function that you get here is somewhat unique. To see the world through the drone’s eyes, you mount your smartphone into viewing goggles. The goggles themselves then block out any other external visual elements so that you are simply seeing the world from the height of the drone. Now that you know a little bit about what the Parrot Bebop looks like, let’s look at some important features that will clue you into how it operates. We were very pleased with the battery life that you get here. This unit will be able to run for up to twenty-five minutes before requiring a recharge. To put that in perspective for you, average drones are usually only able to run for about ten minutes before needing to come down. Even really good drones often come in at around twenty minutes. While twenty-five minutes may not sound very long in a broad sense, relative to the market, the number is very impressive. The Bebop Parrot app is what facilitates your ability to see the world through the eyes of the drone. This software allows you to sync up with the camera for an immersive view. The nice thing is that the app is also where all of your photos and videos will be stored. The consolidated location makes access to everything quite easy. The app is compatible with all major smartphones. The downside is that if you do not have a smartphone, you are out of luck with this drone. We should preface this by mentioning that the Follow Me feature is not native to the app. It is downloaded after a purchase. In other words, if you want to use this feature, you are going to need to spend more money even after having purchased the drone. There is currently a free trial option that will allow you to test it out for two weeks if you aren’t sure that you want it. Otherwise, the service is available for a flat rate of $20. The way that it works is actually quite interesting. The Follow Me app uses GPS and visual recognition software to track a specific target. It can then provide video and photographs of said target. The nice thing is that it gives the person who usually operates the drone the opportunity to capture their own performance. For example, this mode would be a good way to photograph or video a hike, run, or biking exercise. Another nice thing about this mode is that you won’t have to worry about losing sight of the drone. If for some reason you are separated, a simple push of a button will reunite you. It is only fitting that we pay some special attention to the camera as well. The lens through which you get to see the world from the Bebop 2 is quite good. The 1080p HD camera does provide a good look from the skies, enabling users to take detailed footage at will. It also features a three-axis stabilizing system that will ensure the image always stays clear. The camera itself is 14-megapixels. To put this into perspective, the newest iteration of the iPhone features twelve. While this camera is not going to rival the quality of a studio setup, it will be quite capable of documenting your adventures. Unfortunately, all of the drone’s memory is internal. This means that if you want to add additional memory, you are out of luck. That said, what you are given isn’t terrible. You get 8 gigs here, which is a decent amount of storage. While an exact estimate would be difficult, that should equate to close to forty minutes of shooting. Perhaps a little bit less since the video is in HD. The good news is that the app itself can store more than that. Once footage or photographs have been uploaded you can wipe the memory and start over. Since the battery life of the drone is only twenty-five minutes anyway, you shouldn’t really ever encounter a problem. We did notice one issue that was worth mentioning. The drone seems to drop its connection quite often if you get too far away from it. The drone will continue to fly when a connection has been lost. However, you won’t be able to navigate. Once the connection is reestablished, the drone will perform as intended. However, the interruptions can be frustrating. The bottom line is that this drone does a lot right. It is true that there are more affordable drones on the market. It is also true that there are options that are significantly more expensive. The nice thing is that, for a moderate price, you get high-end quality. People with a natural inclination towards photography and videography are going to find plenty to like. People without that inclination might just develop it. There are issues. The “in-app purchases,” as it were are a little bit of a turn-off. When it comes to performance though, we don’t find much to complain about. If your objective is to find a great drone at a manageable price, the Parrot Bebop 2 should be one to consider.